Give your team the tools they need to operate at a measurably world-class level, producing code with far fewer bugs in less time. This is what my one-day Better Firmware Faster seminar is all about. It's fast-paced, fun, and uniquely covers the issues faced by embedded developers. Information here shows how your team can benefit by having this seminar presented at your facility. I'm also a huge fan of the LogicPort, and the built-in decoders for various bit-level protocols are worth their weight in gold. It blows my mind that some of the better-known MSO vendors out there charge extra to add these software-based decoders to their basic logic analysis capability! I first used it to help with debugging a particularly nasty display interface issue. We would get data for a while, and then the display would inexplicably go dark. We suspected that the clock was getting killed, but trying to find problems with individual signals using a scope was a nightmare, and like shooting in the dark. It took a bit to get all of the control lines connected up, but once we did so we were able to capture data up until a particular clock signal stopped being generated. 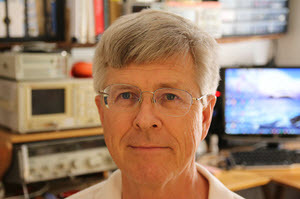 I had communicated with the folks an Intronix before buying my LogicPort, and they brought a trigger out port to a 2-pin header, and we were able to use this to fire an oscilloscope in single acquisition mode. A few runs later, and we discovered some gi-normous ground bounce on the clock and data lines going to the display. More recently, I used it to help me debug some code to read/write MicroWire (sort of like SPI) EEPROMs, and to read/write 1-Wire EEPROMs via an I2C-to-1 Wire bridge IC. The built-in decoders made this so much easier than trying to sift through tons of edges looking for the "right" patterns. I'd probably still be working on that code a month later if I hadn't had the LogicPort handy. One other tip for people who plan to buy one of these babies: Do yourself a favor and get an extra connector cable and extra micro-grabber clips. If you have a complicated test setup, you can then leave the relatively inexpensive cable in place while you borrow the LogicPort to debug some other project! Also, the connectors on the cables do wear out over time, so don't be surprised if you find that you need to put a new connector on one of the pins down the road. Overall, the thing has been wonderfully robust. I keep it in an old CD player Velcro case when I'm not using it to keep everything together and protected. Another tip: Try to get your hardware counterpart to put some 0.1" square post headers on the board at key test points. This lets you slip the female connectors right over the headers, without having to clip a micrograbber onto anything. It's a much more secure connection, but you have to plan ahead for it. Highly recommended! Glad to hear that my purchase was not just a fortunate fluke. Scott's advice about getting an additional cable and grabbers is spot-on. The cheapest source for grabbers that I know of is actually Intronix themselves, where they are advertised for $1.75 each. Their focus is, "Electronic Hardware and Fasteners". Not sure how they compare to McMaster -- they (M-C) are the gold standard, after all. 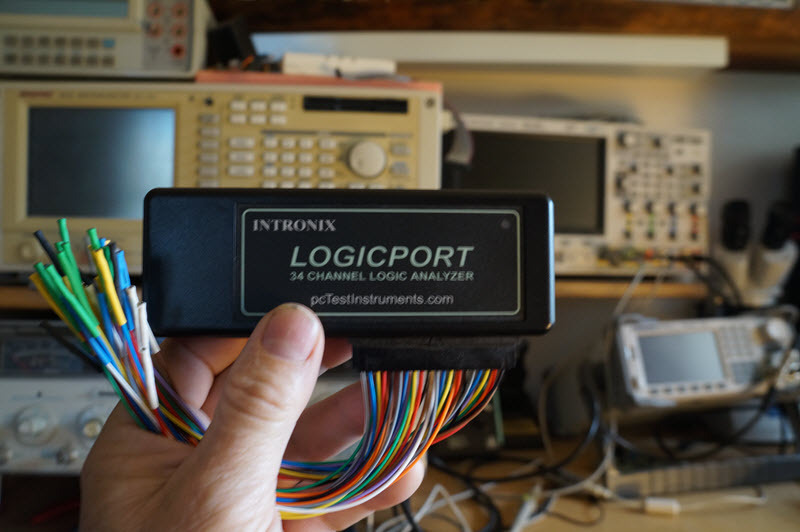 The LogicPort is probably the best USB-connected logic analyzer I've reviewed (review here). The hardware sparkles at 500 MHz and 34 channels, and the user interface is great. I'm giving my LogicPort away to a lucky Muse subscriber (it does not come with the grabbers). The contest closes December 31, 2015. Go here to enter. It's just a matter of filling out your email address. As always, that will be used only for the giveaway, and nothing else. Something like this may be better suited to a pipelined processor, because it allows multiple branches to be processed in parallel: http://cmsc411.com/history-arm-integer-pipeline (this link seems to be broken). Of course, in an FPGA, this is best done in a LUT, which it just takes a single clock cycle to perform (and very little fabric). As always, all of these methods work best with a good helping of debouncing the inputs as previously discussed. Here is a neat quadrature routine I wrote in Z80 assembler many years ago based on an article I read somewhere (maybe from you). I have rewritten since in other languages and cannot seem to put my hand on them. Have used this same logic with knobs and motors and works very well as long as it is called by interrupt or fast enough to not miss anything. Can easily be implemented in c using a simple switch() statement. ; There are only 4 possible current positions. ; these represents Up (CW) and One represents Down (CCW). ; it is very easy to make a Jump Table. ; Any other combination is not allowed and should be  ignored. ; CW rotation and a negative Number indicates CCW rotation. ; The last position of the knob is stored in the lowest two  bits. ; Bits 2 and 3 hold old data which should be discarded. This was a problem I had with Protel (98SE). So I found an option to flat file the data. This removes a lot of the problem. The real issue is the 'desire' by many EDA vendors to use a "magic" database for storage of the data. A data base is great for the RIGHT use. However for the wrong use it is dangerous. Protel 98SE suffered from the use of a 'common' providers faulty RDMS system so they gave the tool user the option to flat file the data. This made the tool WORK immensely better (side affect I guess) and of course when it did crash (which was seldom when it used a flat file), it was easy to recover your files. KiCAD (http://kicad-pcb.org/) is an open source tool for doing "EDA" stuff. It does several things that make security less of an issue. No data base, it is almost all flat text files. Although it does have a central repository for ones schematic capture symbols, PCB foot prints, and 3d models. These are not part of your design, period. Their is no link, instead it creates a part cache and that part cache is part of your design. I would prefer they make it not a cache (because if you add items to the cache they can disappear if you don't use them immediately). It's open source, seriously, it's maintained by some fairly (crazy) individuals who talk about what to 'fix' next. The current version is 4.0.0 (new release as matter of fact on Nov 29, 2015). It's NOT perfect nor do they claim it to be able to do cross stitch as well as RF signal analysis. (Joke really ... really.) They are working on the plugin system, still (much to my eternal ... where is the documentation for the plugin interface chagrin). It does have some nice tools include creapage and clearance (electrical spacing)., track width and current, transmission line, RF attenuators, color code (thingy) and for those who are making cost effective boards it gives information for board classes and tolerances for the class so they can proper specify the class to the fabricator. It's not the greatest tool, it DOES have a learning curve. Fortunately you have freenode irc and #kicad if you have some questions. The tutorials are good enough. The interesting thing is by far it was the easiest EDA tool to start using. I just poked around for a bit and found myself making symbols for parts in about 3/4 of an hour. Things get more complicated as your begin to have a more complicated design, and the PCB <=> schematic conversion takes a bit getting use too. However if you want to "hand" your design out, it's supported and open source. So the 'earning curve' of using it is not so bad (pun intensive). Just a quick note to let you know your joke of the week reminded me of one of my favorite lines from a novel. The inimitable Vlad Taltos from Steven Brust's _Issola_ says something like, "I’m generalizing from one example, here, but everyone generalizes from one example. At least, I do."